With many economic indicators over the past few years showing a downturn as Alan Austin has pointed out, it interesting that growth in the economy is a mantra for the conservatives. The LNP government’s assertions inherent in their three word slogan of “Jobs and Growth” presumes we are experiencing these in certain quarters. Let us begin examining a few. Australia’s net population growth is still positive. Moving steadily from 19M in 2000 to 24M in 2016. The net populations growth by itself is the product of accumulated ebbs and flows. For example, in 2012-13 a total of 91,761 people indicated that they left Australia permanently. Many of them professionals but only half of them were actually born overseas. A concern for the department of immigration which sees it as “a loss of skills and experience as well as a loss of social investment in fields such as education, training, health services and settlement costs of immigrants”. The growth rate per year although, has been decreasing over time. From it’s highest point in 2008 of 1.22% it had fallen steadily to 1.09% in 2014 according to Miguel Barrientos founder of IndexMundi. From this site other statistics from multiple sources have been garnered. Australian birth rates have been steadily dropping from 13.08 in 2000 to 12.19 per 1,000 persons in the population (per 1K/Pop) in 2014. Death rates since 2000, have been increasing as would be expected our ageing population dominating and rose to 7.07 per 1K/Pop in 2014. So why, with thousands leaving, a growing death rate and slowing birth rate do we have a steady total Australian population growth? 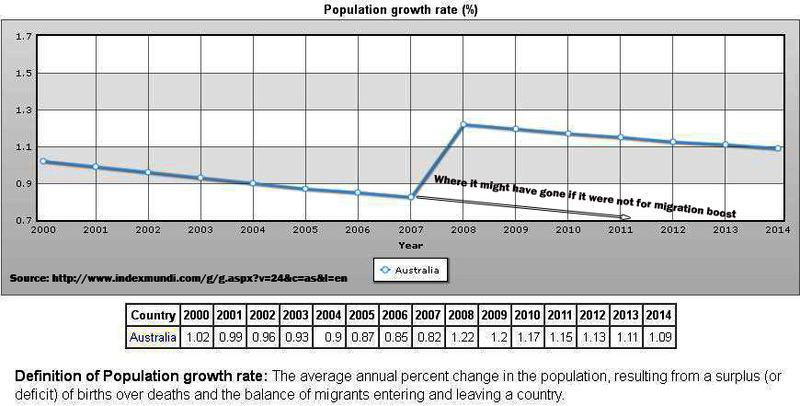 The answer to that and the anomaly of change you may have noted between 2007 and 2008 on all the graphs, is migration. The influx in migrants, whether they be asylum seekers, visa holders or all manner of foreigners, maintain our growth. Much to the ire of many red-neck Australian “tea party” proponents who would rather we send even more “back where they came from” than the 91K we lose in a year. While the Department of Immigration is optimistic that net migration rates will increase in the future – and has published optimistic forward estimates figures – the actual historical statistics shown no such trend. Net migration rate which was at 5.74 immigrants per 1K/Pop in 2014, has been steadily decreasing since 2008 when it was 6.34. 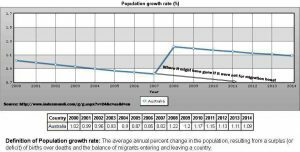 Despite the annual departures without the larger influx, the total Australian population growth might be in serious decline. 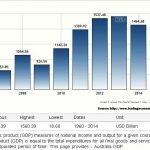 Given the financial, social and intellectual contribution the likes of migrants, including asylum seekers, have proven to supply Australia, it remains economically irrational to be restricting their entrance. They don’t take jobs as that irrational argument by some protests, they create them. The example of Karen refugees making $40m worth of contributions to the economy in Nhill, Victoria, is a classic case. Spending 1.2 Billion a year to keep them in detention, when they could be boosting our economy by millions is both wasteful and sheer economic vandalism. Taken for reasons that have more to do with politics of fear mongering that is pandering to the emotional insecurity of a racist Australian population. It certainly has nothing to do with good economic management of a resource that is, desperate to be here and that we are blocking. So if we are socially & politically inhibited in using the resources of people to aid our economy, are we working well with the population we have in seeking to grow our net wealth? Our economic results are reported as positive news. Recent quarters have shown Australia’s economic growth has beaten expectations. This is particularly good news especially after our total GDP dipped in US dollar terms from 2013 to 2014. 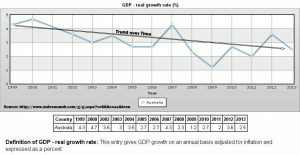 Unfortunately the growth rate in GDP despite numerous fluctuations, has been showing a falling trend generally since 1999. 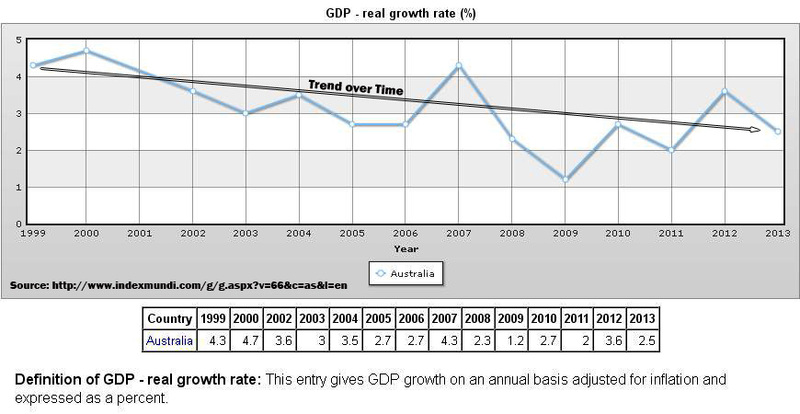 GDP per capita although, has shown a stead increase over the same time. It looks prosperous, provided you fail to account for wealth inequality. One of the noticeable absences from Joe Hockey’s Intergenerational Report (IGR) last year, was no indicator of the Gini coefficient (a normally standard reporting indicator in previous IGR’s for socio-economic impact of policies). 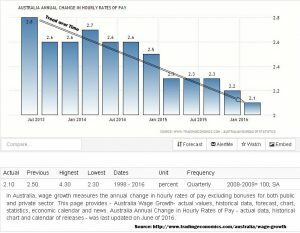 The Australian National University has noted that wage inequality has increased steadily from early 1980s onwards  and ACOSS has noted an increase in numbers of citizens living below the poverty line. Poverty numbers in Australia thrust upward to 2.55 million in 2014 (over .6 million of that being children). This continues the long-term trend of growing inequality in Australia. This factors certainly skew the per capita growth in GDP towards the already wealthy demographic. So many conservatives hope the coalitions focus on Jobs and Growth is a progressive step in the right direction to shift the burden of growing poverty and provide jobs that can lift our limited growth population out of poverty. So are jobs the solution and have jobs increased? Scott Morrison is loudly boasting, “yes they have!” And if you want to retain that shallow positivist joy, this is where you should stop in your examination. Participation in the labour force has continued to increase to just over 12.78 million in May 2016. It was just over 12.46 million when the coalition government came into power. Unemployment has of course increased while available jobs in the market have decreased. Jobs growth (according to the Coalition) of 300,000 since they came into power, is not actually keeping up with labour force growth, let alone expanding to overcome the decreasing population growth rate aforementioned. When you consider that we have just turned over 11 months of consistent part-time job increases measured against the fifth straight months of full-time job decreases, then it is not hard to know where the real “Jobs and Growth” are occurring. When Scott Morrison got excited about apparent jobs growth in recent ABS statistics, he did not delve too deeply into their makeup. But isn’t any job even if it is a part-time one, at least “a job”? Probably not when it cuts you off from Newstart support but just like “Newstart”, still leaves you in poverty. The recent years have seen the rise of an unemployment problem called “the working poor”. A phenomenon where working families who are subsidised by wages, live below the poverty line. Another unique employment issue (even recognised by the Telegraph who have a reputation for a lack of sympathy for the unemployed) is the homeless but fully employed demographic. The National Coalition for the homeless claimed 44% of homeless people have jobs and that was a claim from back in 2009. Given that the ABS does not rate you as unemployed if you have worked for as much as one hour in a month, none of these homeless demographics register as “unemployed” but they do qualify as part of the “jobs growth solution” boasted about by the Liberals. But at least if you have one of Joe Hockey’s “good” jobs (or your family needs a couple of them) and can afford a home, you have to be making some leeway? Chances are, if you are not a baby boomer who has finally paid off your home and retired, you are burdened by an enormous amounts of private debt. Millions of Australians are lumbered with housing debt. 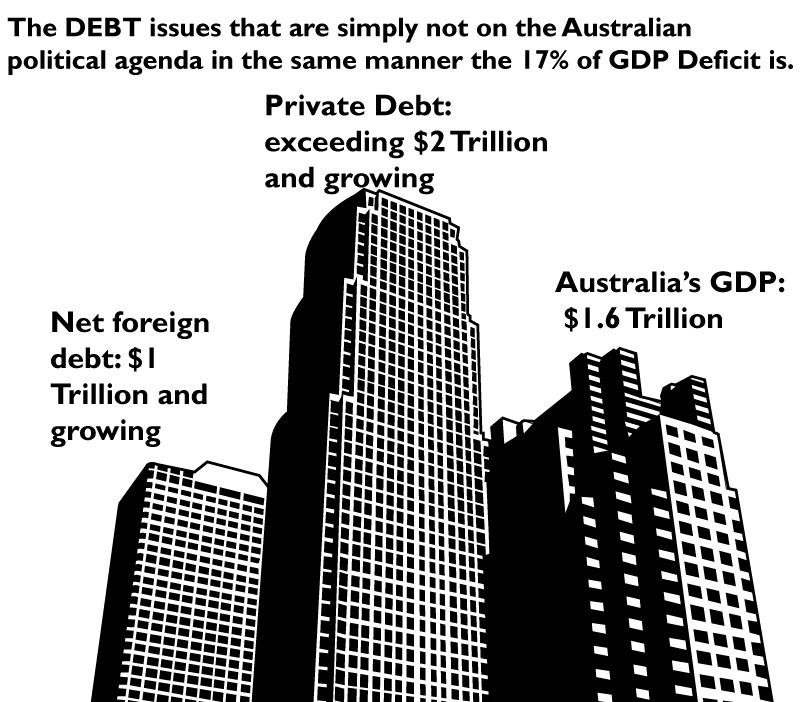 Private Debt zipped past our GDP to loom above it by over 123%. 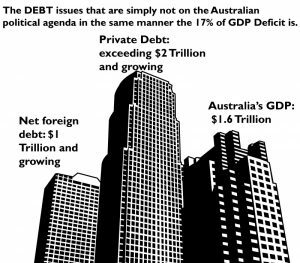 The over $2 Trillion in private debt is being chased by it’s little brother, “Foreign Debt” who has only grown to over $1 Trillion but has ambitions. 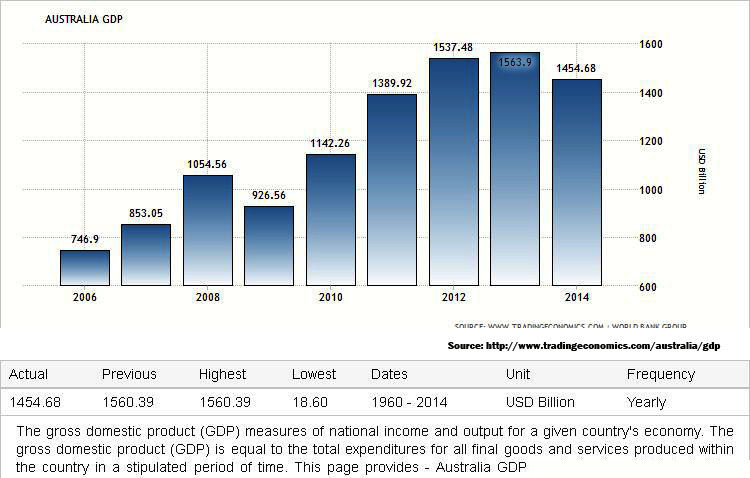 Australia is already living beyond its means with faint ambitions by the average wage earner to grow their wealth. So in summary, Debt and housing costs are growing but wages to afford the debt and housing is not. If I were to provide advise, it would be if you have a full-time job, don’t leave it. They are vanishing and there is only growth in part-time jobs. If all you can find is a part-time job, the chances of you descending into poverty are statistically significant. Don’t live in major cities. Given there are at least 8 times the number unemployed as there are jobs in the market, your chances of getting a job,- even a part-time one – are slim to none. Australia won’t allow highly motivated foreigners – like asylum seekers – into the country to boost our economy, as they have historically proven to do over decades. In fact we would rather spend billions abusing them in offshore gulags, then give them that opportunity. This is the price of being insular and parochial. Conservatives with a reputation for a love of money would rather spend billions on locking people up when you could be exploiting them to create millions. Am I the only one that is puzzled by this? So with a slowly diminishing rate of growth for population, GDP, hourly wages, full-time employment, and innumerable other economic indicators and a rapid rise in debts, housing prices, part-time employment, poverty and inequality, has it occurred to anyone that something is wrong here? The record of the current government is laid out in its last three years of office. On July 2nd you have a chance to ensure this continues. That choice is your’s Australia! With a heavy heart, I have only one comment to add to this article in the July that followed that election.